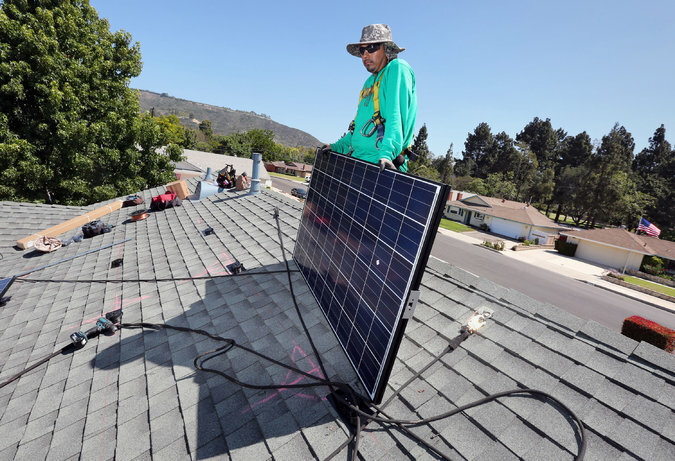 A solar panel being installed at a home in Camarillo, Calif. The state aims to get 50 percent of its energy from renewable sources by 2030. The future of American energy, according to one widely held view, will include solar panels and wind turbines continuing to proliferate, churning out ever more electricity and eventually eclipsing fossil fuels to help offset the forces of climate change. With the cost of renewable technologies falling sharply, that vision is starting to take shape, especially in areas with abundant sunshine or steady wind. Here in California, the state is making such quick progress toward its goal of getting 33 percent of its electricity from renewable sources by 2020 that Gov. Jerry Brown raised the ante earlier this year, setting a target of 50 percent by 2030. The shift sounds simple in theory — plug more solar and wind into the mix, and unplug more coal- or gas-burning power plants, sparing the world millions of tons of greenhouse gases. But the reality is more complex. Because of the variable nature of these renewable sources — no electricity is generated when the sun goes down or the air is still — they add strains to the system of transmitting and distributing power. Batteries have long been seen as one of the main ways to work more renewables into the electrical grid, by storing electricity during times of excess generation and releasing it when needed. Now, spurred by mandates in California and other states to deploy storage, by the rise of rooftop solar systems, and by falling prices as Tesla Motors and other companies makeplans to produce vast numbers of lithium-ion cells, batteries are set to play a significant part in the nation’s power supply. Challenges remain, however. Despite plummeting prices, large battery systems generally are not yet economical for helping to integrate renewables on a broad scale. Instead, utilities and other companies are using them for different purposes. “Let’s call it a stretch goal,” Imre Gyuk, who directs a Department of Energy program that has sponsored demonstration projects for energy storage, said of plans for vast deployment of batteries for integrating renewables. Costs still have to come down more, he said, and not just for the cells, but for the control equipment as well. There are several ways that the electrical grid can cope with more renewables — by large consumers of electricity agreeing to have their power reduced at critical times, for example, a concept called demand response. And there are other ways to store electricity, such as pumping water, compressing air, spinning flywheels, or even making ice. Battery systems, which feature racks of cells wired together, and are capable of storing large amounts of power and releasing it over an hour or longer, have some advantages over other storage methods. They can supply power nearly instantaneously and handle continual cycling between charging and discharging. And as the manufacturing of batteries and control systems scales up, it will be easier and cheaper to deploy “plug and play” systems, rather than designs that are unique to each situation. A large battery storage project in Notrees, Tex., illustrates the current economics. Built in 2013 for about $44 million by Duke Energy Renewables (with the Department of Energy contributing half of the amount), the project consists of thousands of lead-acid battery cells near a large wind farm. Instead, he said, the grid operator in Texas was interested in the Notrees battery as a fast-response source to regulate the frequency of the electrical current, which keeps the grid stable. Maintaining a reliable grid is a high-wire act for operators, who struggle to keep a balance between the supply of electricity from generation sources and demand for it from customers. Batteries are especially valuable because they can respond quickly, adding more power to the system in a second or less. Fossil-fuel plants that are often kept on standby for this purpose can take a few minutes or more to reach a level where they can provide the same service, Dr. Gyuk said. And all the while, fossil-fuel plants are emitting greenhouse gases. Here at a Southern California Edison laboratory in the shadow of the San Gabriel Mountains, scientists and engineers are doing some of the fundamental work to help make widespread battery storage happen. Accompanied by the steady thrum of electric current, batteries — lithium-ion cells like those used in electric cars and other types — sit in rows of sealed testing chambers. The batteries are undergoing continuous charge-discharge cycles in heat and cold, dripping humidity and desert dryness, to simulate the conditions they may face when deployed on the electrical grid. In 2013, California mandated that by 2020, Southern California Edison and the state’s two other large investor-owned utilities add a huge amount of storage — about 1.3 gigawatts, or more than 10 times the amount of storage deployed worldwide in 2011. Mark E. Irwin, Southern California Edison’s director of technology energy storage, said that for now, the utility is most likely to use batteries to relieve its distribution system of peak loads that would otherwise require expensive improvement of wires and other equipment. California has also set a priority to develop distributed generation, in particular moving away from large centralized solar farms and toward residential or neighborhood-scale solar power. Batteries will no doubt play a greater role in this, Mr. Irwin said. “It will make it easier for people to put renewable systems out on the local grid,” he said. “But in the meantime, storage has to find a way to first walk,” he added. Helping to defer upgrading costs, he said, is one way to get storage started.